Two months ago one of the most important events in the wine industry took place in Düsseldorf, Germany. ProWein, by all measures is today the world’s largest wine and spirits fair. With more than 60.000 wine business professionals from over 100 countries the event is an ideal place to get a snapshot of the actual state of the industry. This year the fair organisers and researchers from the Geisenheim University took it one step further. They polled 1,500 professionals who work for companies that cover the entire wine business value chain: small and large estates, wineries, wine merchants, wholesalers, retailers, exporters/importers, HORECA companies. The research probed participants about their perception of the economic situation of the sector, the demand for origins and their outlook about market attractiveness and associated risks. One particularly relevant question was addressing the sales channel by asking “How wine industry players see the future of purchasing and sourcing channels”. The answers revealed interesting trends that apply with no respect to geography. Although market specific differences of course exist, there is an industry consensus for the following statements. it is important to emphasise that the statistics are based on the opinions of active members of the wine business value chain – there is no better source of information than those who work in the industry. The study found that marketers expect to increasingly source their wine directly from estates and wineries. Procurement through sales agents (importers, distributors, wholesalers or wine agencies) will decline considerably by 2020. We see this to be consistent with the growing competitiveness of the wine business. In an industry where global consumption every year stays below global production the fight for margins increases. This shorter procurement chain projects more difficult times for importers, distributors, wholesalers and wine agencies. These players should look into expanding their business portfolio beyond trade only. Adding marketing and promotion types of services to create a competitive edge can make it still worthy for producers to sell through these companies. Unless they prove their value-add, in all cases where direct sales is a possibility, their role will disappear. 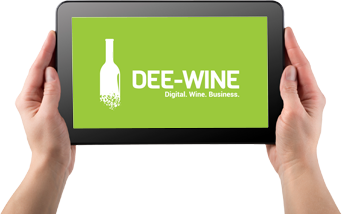 The study found that both online sales by wineries, as well as by retailers will drive the shift of the procurement chain. We see this change fuelled by Millennials rapidly becoming a major new segment of wine consumers whose purchasing habits are significantly different. Producers and retailers should adjust their practices to match the demands of digital natives who prefer to buy online or at the winery. Adaptations should not miss changes to marketing, technology (website/webshop) and communications practices. These are all critical to get a grip on the sales process. The study also found that responses by US and German wine industry representatives illustrate some fundamental differences of these two markets. The collected data suggests that direct, ex-cellar sales channel will be 5 times more relevant in the US by 2020 than today. In comparison, industry professionals expect no similar change in Germany. Ex-cellar sales is already today a significant revenue source for German wineries. 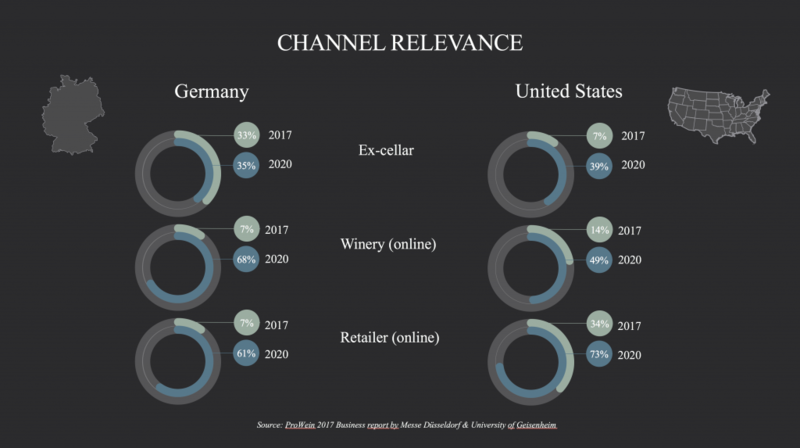 In comparison, the increasing demand by Millennials for direct engagement with the winemakers and wineries fuel the growth of this channel in the United States. American producers are well-positioned for this change: while already active in the social media space, adding personal, face-to-face interactions to their relationship with consumers will be a natural move. Although relevance of online sales will grow notably in both countries but the shift will be much more substantial in Germany. Maturity of the online wine retail and direct sales is still rather low in Germany. Comparative data suggests that for German consumers the personality of the winemaker plays the most significant role in making purchase decisions. As wineries expect to increasingly cut agents out of the value chain and take control of the sales process themselves, online sales is expected to surge. Retailers, on the other hand, expect to cut costs and move part of their business also to the online channel. Running sales on the internet allows for the application of new, digital marketing technologies which drive lower customer acquisition costs and higher conversion rates. The study revealed that producers and marketers active in various countries see the same trends in how sourcing will change (click here to download the full document). It remains to see whether the interviewed wine business professionals understand what changes these trends demand to their sales and marketing strategy. One thing is certain: continuing with current business practices without adjustments is lethal. Requirements set by the new wave of consumers, the change in buying behaviour and growing proportion of online sales have to be addressed. Time to prepare for a change!